I never found this advice particularly difficult to follow. For instance, in middle school, while our peers were discussing their first kisses and Justin Bieber, my best friend and I brought books and silently read alongside each other during lunch. When a teacher approached me about this “abnormal” behavior, my response was unabashed: I would rather read than socialize. In high school, this confidence still held true; largely unfazed by what the “popular” people were doing, I confidently spent Friday nights watching Shark Tank with my parents, maintained a small but close group of friends and wore outfits that resembled those of a middle-aged kindergarten teacher. Granted, being myself wasn’t always beneficial; my inherent lack of competitiveness, for example, didn’t bode particularly well for my athletic endeavors. Nor was I entirely immune from social influence or pressure. But for the most part, I had no problem embracing who I was and living according to my own rules. It wasn’t until I got to Dartmouth that being myself suddenly became incredibly challenging. With the omnipresence of my evaluative peers, Dartmouth’s intense culture of conformity, and the constant pressure to make college the “best four years” of my life, I found myself basing decisions not on my own preferences, but on whatever seemed the most “Dartmouth” thing to do. On weekend nights, feeling compelled to go out because that’s what Dartmouth students did, I sat on cheap leather couches in cramped dorm rooms and descended into grimy frat basements, wholeheartedly wishing I were anywhere else. I made plans with people for every single meal, including breakfast, because Dartmouth students — at least, the kind I wanted to be — never ate alone. I traded in my pastel cardigans for plaid flannel shirts and copious Dartmouth gear, learned to play and pretended to care about pong and feigned excitement for big weekends, despite finding them consistently underwhelming. I did trivial things, like studying in the library even though I was more productive in my room, or standing in the outlandish KAF line to get coffee even though I preferred Novack, simply because I considered them more “Dartmouth” than the alternative. I posted pictures of Baker Tower on Instagram and convinced myself that I was in love with Dartmouth, despite my immense homesickness and loneliness, because above all, Dartmouth students really love Dartmouth. None of this made me any happier, but I feared that defiance of this unspoken but ubiquitous Dartmouth code would lead to social exclusion. More importantly, I was convinced that the extent of my participation in what was “Dartmouth” was directly correlated with the quality of my experience here. Ironically, this classic “Dartmouth” experience ultimately brought an end to my intense conformity. Social pressure to do “Dartmouth” activities and make the most of my time peaked sophomore summer. Additionally burdened by the frustrations of my leadership role and other personal difficulties, I found myself enormously, and irrevocably, disillusioned. Standing in a fraternity basement at tails one night, miserable and forcing myself to make shallow small talk with an ease and lightheartedness I did not feel, I was overwhelmingly struck by utter exhaustion. I couldn’t be the aspirational “Dartmouth” ideal, but suddenly, I didn’t want to be. In losing the varnish of my own conformity, which I had mistakenly believed was the fulfillment of a genuine “Dartmouth” experience, I began to see how performative, inauthentic and problematic it all was. Obsession with image — whether in physical appearance, so-called “social capital” or social media — is pernicious at Dartmouth, and both facilitates and perpetuates its conformist culture. 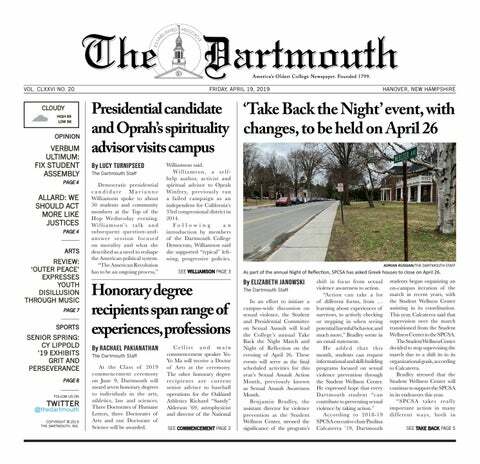 Moreover, the qualities and activities I considered most “Dartmouth” were often extremely exclusive of entire segments of campus, particularly marginalized communities. In beginning to evaluate my complicit role in this harmful conformity, I questioned why I had ever sacrificed my values or cared in the first place. Fortuitously, this shift coincided with seven much-needed and restorative months away from Hanover between my fall Foreign Study Program in London and winter internship at home in Boston. The peaceful solitude of London which afforded distance from Hanover and without any standards to which I felt compelled to conform, I felt renewed, content and centered. At home, I was reminded of the middle schooler who shamelessly read Harry Potter during lunch for the simple reason that she wanted to, and vowed to recapture that confidence. When I returned my junior spring, I approached the rest of my time at Dartmouth with a simple guideline: just be yourself. Barring necessities, if I genuinely did or didn’t want to do something, I followed that desire. The social judgment, FOMO and subpar Dartmouth experience I feared did not materialize; instead, doing Dartmouth on my own authentic terms — whether that meant exclusively drinking Novack coffee, limiting my trips down Webster Avenue, distancing myself from my sorority or openly discussing what I resented about Dartmouth — was instead empowering and liberating. So to those of you who still have time left here — whether this results in a Dartmouth experience that resembles those advertised in its glossy brochures, something entirely different or somewhere in between — I echo my parents’ frequent refrain: just be yourself.